Hey there! I have a fun, silly project on the A Flair for Buttons blog today. The giant title says it all! It's the FREE 4th of July cut file from Paper Issues. I used flair from 3 different sets to complement each color. What a perfect pair, The Selfie flair from the Comic Words 1 set sits right next to, you guessed it, our selfie. Tucked next to the white like a fireworks burst is a piece from the Noted Flair 1set. Lastly, next to the bottom photo I had to use a piece from the Stars & Stripes set. It has all three colors tying them all together. 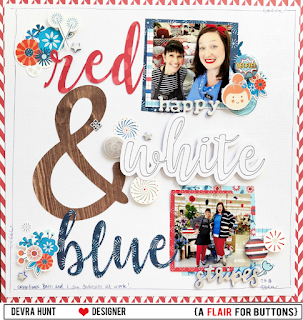 I used Pebbles Land that I Love because it's, well, Red, White & Blue! I cut the words from some of the patterned papers. I chose the fireworks and flower stickers to keep it light and colorful. A co-worker and I came to work in almost identical outfits. Of course we had to take a photo. So then of course I had to scrapbook the photos! Thanks for taking a look at my creative view today. Come back again soon I'll have more to share. You can get all of these flair and more in the A Flair for Buttons Etsy shop.